I always tell my son - always do a good job in everything you do – someone is always watching! I remember asking my Mom if I could buy the much wanted Jordache jeans that every girl absolutely needed in the early 80’s. She looked once at the price tag, then back at me and said, if you want them figure a way to buy them. Which was her way of saying – get a job – well, I was only 12, but I really wanted those jeans, so I was on a mission. Of course, most normal girls babysat or did errands for people those days, but not me, I was the ultimate outdoor girl and thought since I always watched my Dad cut our lawn, I could do it and get paid! I started by asking my 65-year-old next door neighbor if I could mow his lawn and he said sure. 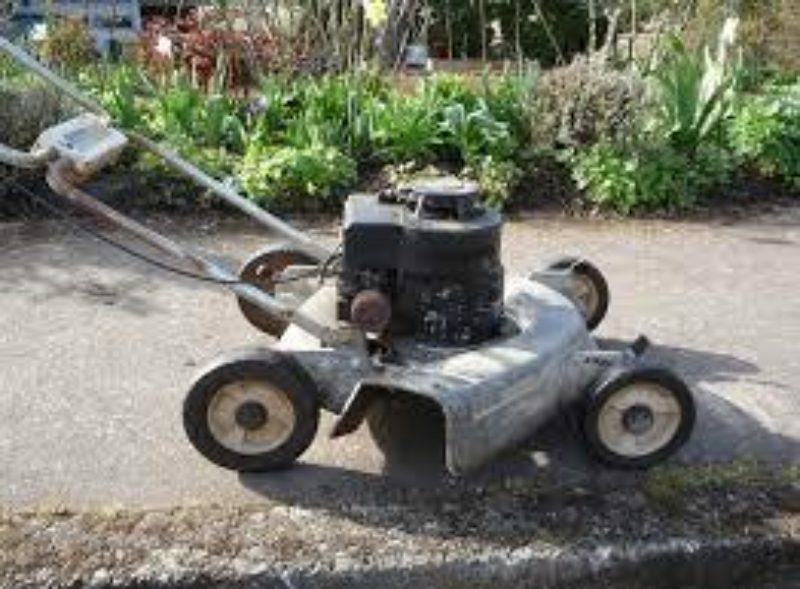 I asked my Dad to let me use his lawn mower (it looked almost exactly as the picture above). Well…he showed me how to use the mower first. My dad was known for that ‘perfect lawn’ in the neighborhood, so I knew I had a great teacher, but he must have repeated himself at least 10 times before he handed the mower over to me. I was ready to go to work! Now, I lived in an area in Delaware County, PA swarmed with a bunch of teenage boys trying to always get my neighbors’ business! I knew I had to do a good job to be better and go the extra to get and keep the business! So off I went and started mowing his lawn. I realized when you are 12, a relatively small lawn can look a lot larger when you start mowing it – and I also found out that when you cut grass it can really flare up your allergies (there was no Zyrtec back then!). I had to find ways to be different, so I did the extra by ‘weed whacking’ the lawn after I mowed it – apparently my competition didn’t do that – check! Then I noticed the vegetable garden had a bunch of weeds mixed with the tomatoes – I plucked away – check! I swept all the grass clippings with a broom and dustpan until it was all clean and tidy – check! Two hours had passed, and I thought I did a pretty good job for being my first time. My neighbor looked at me and looked at his lawn and said, ‘You know Maggie Scratch (that was my nickname he called me) not bad, you can do better next time’. I was shocked – better– what did I miss? Now most people would have been aggravated with that comment, but I didn’t take it that way, I took it as he was challenging me since he wanted me to succeed (he knew me since I was a baby!). I figured it out - the hedges!! His hedges needed to be trimmed, so the very next day I borrowed my dad’s clippers and trimmed those hedges – which earned me more money in the process! He told me what he had said a week later and I just smiled. He also told me he noticed the attention to detail I did on his garden and the fact that I cared much more for his lawn than any other person before me. He watched me the whole time through his kitchen window and never said a word. But he was watching. He also told the other neighbors in my area about my work and before long I was having neighbors coming to my home and asking me if I could mow their lawn too. It was so exciting! Ironically, a few years later, when I was a senior in high school and still mowing his lawn in 1986, he came to my senior awards ceremony with my mom. When I was receiving an award, the Principal saw my neighbor next to my mom, standing and clapping his hands for me. The Principal asked him, you must be one proud grandfather – my neighbor laughed out loud and said, ‘She’s not my granddaughter, she’s my grass cutter’ and the entire auditorium burst out laughing including me. So, don’t think people aren't watching how you work and the extra effort you put forth in the good job you are doing – they are – it might not be immediate and you might not always hear their complements but know that you did a good job and that someone is always watching! And yes, I saved enough that summer for my first pair of Jordache jeans – of course it was my only pair I ever bought !